In 2003 Villa married his childhood sweetheart Patricia González (who had also been a footballer in her teenage years). They had a daughter who they named Zaida. Her name is engraved on his personalised Adidas F50's,[while one boot bears the Spanish flag, the other has the Asturian flag. In 2009, his second daughter Olaya was born, named after the wife of Fernando Torres, who is a close friend of Patricia. footballing idols are Luis Enrique and Quini. 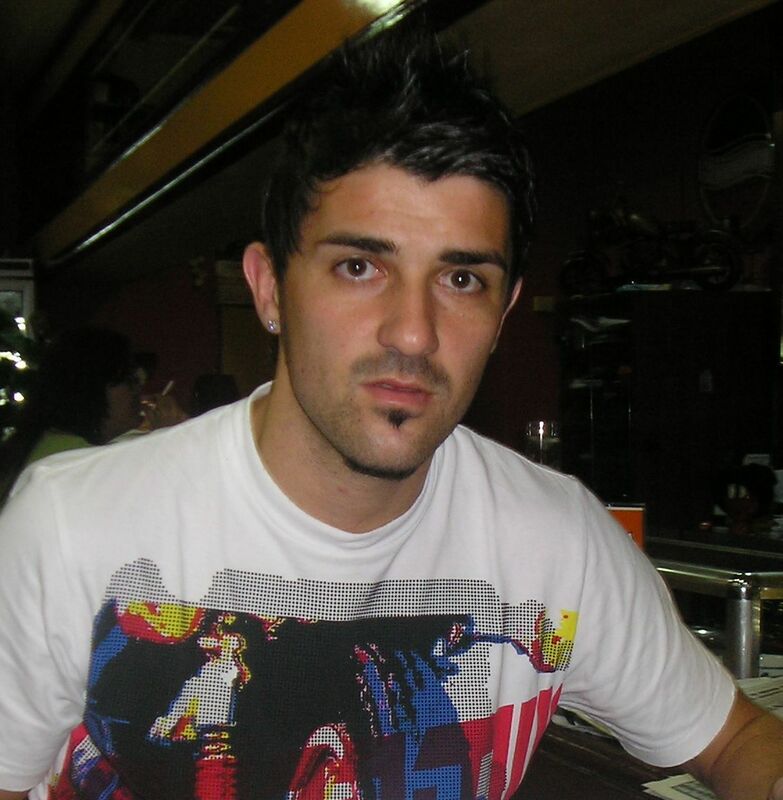 Villa in 2009.Villa frequently attends charity events.He is actively involved with the campaigns of the UNICEF charity.Beginning in July 2008, a "David Villa Camp" is held annually, where children receive training from professional footballers. Villa also participates in a training session with the children.Villa featured on the Spanish box art for video game FIFA 07. MusicIn 2010 he sang alongside Grammy Award-nominated Spanish singer Ana Torroja on the song "Insurrection" by El Último de la Fila. The recording was made for the beneficiary project Voces X1FIN, to help raise money to build an art and education school in Mali. Villa commented that footballers "are an example for society and we have to be ready to get involved in these projects, where we can help people who need it"[ Villa Sánchez (Spanish pronunciation: [daˈβið ˈβiʎa]; born 3 December 1981), nicknamed El Guaje (The Kid in Asturian is a Spanish footballer who currently plays as a striker for FC Barcelona and the Spanish national football team. Despite sustaining a serious injury as a child, he started his professional career with Sporting de Gijón. He moved to Real Zaragoza after two seasons, where he made his La Liga début, winning his first senior honours - the Copa del Rey and Supercopa de España. He joined Valencia CF in 2005 for a transfer fee of €12 million and was part of the Valencia team that won the Copa del Rey in the 2007–08 season. In 2010 he moved to FC Barcelona for €40 million.Villa made his international début in 2005. He has since participated in three major tournaments, becoming an integral member of the Spain teams that won Euro 2008 and the 2010 World Cup. He scored three goals at the 2006 World Cup, was top scorer at Euro 2008 and earned Silver Boot at the 2010 World Cup. With 44 goals, Villa is Spain's joint all-time top goalscorer with Raúl González and has also scored more World Cup goals than any other player in Spain's history. His goals-to-games ratio at World Cup matches is higher than the competition's all-time top scorer, Ronaldo, while the goals-to-games ratio he has achieved for the national team has not been matched by any Spaniard since Alfredo Di Stéfano.